Parkinson’s Disease is caused by degeneration of the substantia nigra cell and pigmented neurons. Parkinon’s disease is associated with low dopamine level. Patient who suffer from Parkinson’s disease will present with tremor, bradykinesia and rigidity. Patient with Parkinson ‘s disease may also present with pill rolling tremor and mask like face. There will be lead pipe rigidity or cog wheel rigidity. 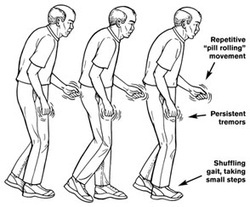 Patient may also present with hyper reflex and difficulty in initiating the movement. Shuffling gait is common. The treatment will focus on medications such as COMT antagonist, dopa agonists, L - dopa and dopa decarboxylase inhibitor. The effect of the medications may wear off or the patient may suffer from the side effect of dyskinesia.